Planned Parenthood routinely discriminates against its pregnant employees, refusing to provide them with adequate rest and often firing or refusing to promote them, according to a New York Times report published Thursday. 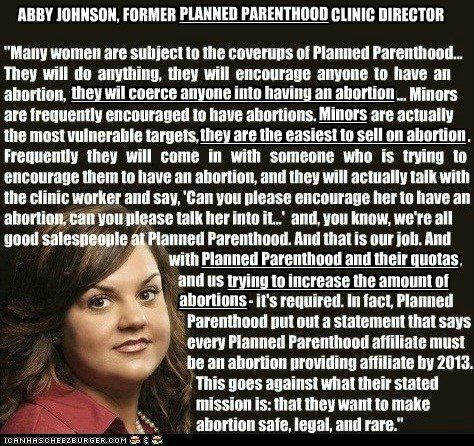 Planned Parenthood supervisors regularly refuse to hire and promote pregnant women or women they believe are likely to become pregnant and, when an employee does become pregnant, they are refused break periods and discriminated against when they return from maternity leave, according to former Planned Parenthood employees in California, New York, Texas and North Carolina. Go here to read the rest. Next up: fire burns, water is wet and wolves like to eat sheep. Go sell deli meats at Walmart or work out of you apartment but get away from that death camp! Satan was the only one that had death quota’s…oh, but Planned Parenthood is his company… nevermind. Satan is the CEO for sure. What does a gal expect when she works for PPH? Don’t just complain, take them to court with a discrimination class action suit. Public exposure is a good way to plant seeds of doubt about Worse Than Murder Inc.